October 17, 2016 October 17, 2016 Dan O. Who to trust? The hunky guys? Or the gal? While he was on-duty during the Gulf War, Lieutenant Colonel Nathaniel Serling (Denzel Washington) accidentally caused a friendly fire incident and it caused him to rethink his military career, even if his superiors were able to look the other way for it. Now, with the war-effort over, he is assigned to investigate the case of Army Captain Karen Walden (Meg Ryan), a soldier who was killed in action when her Medevac unit was attempting to rescue the crew of a downed helicopter. And while it seems like a simple case of a solider being killed by enemy-fire, the more and more Serling begins to look, the more he realizes that there’s more to this story than just what’s on the surface. In a way, someone on the U.S.’s side could have killed Walden and if so, for what reasons? By interviewing everyone involved with the incident and who worked closely with Walden on that one specific day, Serling hopes to find it all out and then some. Meg and Matt? What a dynamic duo! 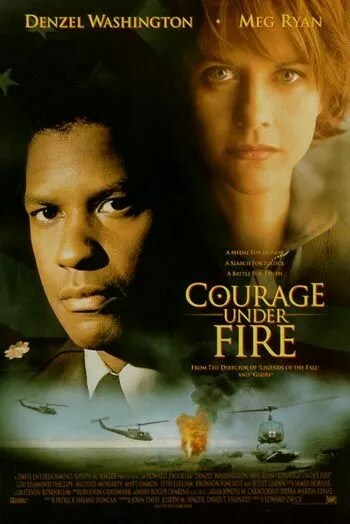 Courage Under Fire is a lot like A Few Good Men in that, yes, it’s a fairly conventional drama-thriller that deals with the Army and a case that needs to be solved, however, it ends on a far more interesting note than it may have ever set out for. With the later, it’s become infamous for its final showdown between Jack Nicholson and Tom Cruise and all of the countless conversations to follow, but with Courage Under Fire, that discussion is literally the whole two hours. In a way, Courage Under Fire is a conversation and an argument both for, as well as against the Army and the war-effort during the Gulf War of ’91, that neither pays tribute, nor attacks the soldiers who have, or haven’t participated in it. Which is to say that it’s a good movie, yes, but it’s also more than just your average war-drama. Director Edward Zwick knows how to handle a lot of material all at once, but what’s surprising the most here is that he does seem to actually settle things down and focus on the smaller details of the story that make it so dramatic. Sure, whenever he takes a flashback to the actual incident itself, the movie is chock full of action, with bullets flying, people dying, and explosions coming out of nowhere. At first, it may feel a tad uneven, but eventually, the movie, as well as Zwick, begin to find a groove that works in helping for the movie get to its smaller moments, while also giving the action-junkies a little something to taste on. After all, the movie, from the ads and posters and whatnot, does appear to be promising this slam-bang, action-thriller of a war flick, which is also very far from the truth. However, that isn’t to say that there aren’t thrills, chills and action – there is, it’s just not in the forms of any sort of violence. Instead, it all seems to come from learning more and more about what really happened in this incident, realizing the conspiracy theories and cover-ups, and then, also seeing all of the different perspectives and how those characters shape the perspectives themselves. It’s a whole lot like Rashomon, but there’s a whole lot going on that keeps the similarities at bay, and instead, just feels like an interesting way to tell a mystery that could have been dull, boring and, honestly, uninteresting. It’s also very hard to make a movie as dull and and as uninteresting as the one it could have been, especially what with the great cast on-hand. As is usually the case, Denzel Washington is great in this lead role, showing a lot of dramatic-depth and compassion, without hardly saying anything at all. He’s the kind of actor that gets by solely on a look of his face and totally makes the scene his, and even though his role may not have been as fully-written as he’s used to working with, it’s still a role that Washington himself works wonders with, even if he does have to put in a little extra here and there. It’s also nice to see the likes of Lou Diamond Phillips, Seth Gilliam, and a young Matt Damon, as the soldiers involved with the incident, showing us more into their souls and what they saw. But really, it’s the performance from Meg Ryan that makes the movie so good, as she shows a rough, tough and brave character who, despite what version of her, we hear and/or see, is still an admirable one. Ryan may seem like an odd-choice for this role, but as she proved in the 90’s, she owned almost every role thrown at her, and it was nice to see her do well with a role for someone who was, essentially, shown in just flashbacks. It honestly makes me wish she did more drama and stayed away from all of the non-stop rom-coms, as she clearly had the chops to pull it all off, but yeah, unfortunately, that didn’t happen. And now, nobody knows quite where she’s gone. Consensus: With a timely, smart message about war, Courage Under Fire brings a lot of thought and discussion to its sometimes predictable format. Just one of the guys. Except, a lot prettier. Depending on who you ask.